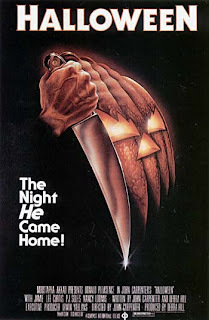 Tag line: "The Night HE Came Home!" John Carpenter’s Halloween is the granddaddy of all slasher films, a smooth symphony of shocks and suspense the likes of which horror fans had never seen before. On Halloween night, 1963, six-year-old Michael Myers (played as a boy by Will Sandin) of Haddonfield, Illinois, grabbed a knife and, for some unknown reason, murdered his teenage sister (Sandy Johnson). Since that time, he’s been residing at the Smith’s Grove Sanitarium, which is where Michael will spend the rest of his natural life if his psychiatrist, Dr. Loomis (Donald Pleasance), has anything to say about it. Then, the day before Halloween, 1978, the unthinkable happens; Michael escapes from the hospital, and Dr. Loomis, convinced his long-time patient will kill again, heads to Haddonfield to warn the authorities that Michael Myers is on his way home. Unbeknownst to the good doctor, Michael is already in town, and has been stalking a teen named Laurie Strode (Jamie Lee Curtis), who goes about her daily routine, hanging out with friends and babysitting for the neighbors, completely unaware death has come looking for her. Many of the elements that would become commonplace in the slasher movies of the ‘80s are there for the taking in Halloween, including horny teenagers, glistening knives, roaming point-of-view shots, and a masked killer who never stays down, no matter how hard you hit him. What’s more, Halloween supports its scenes of violence with an almost unbearable level of tension. Without doubt, Michael Myers is one of the most dangerous characters in the long history of horror films, and rarely do we get a break from the suspense he creates lurking around every corner and emerging from every shadow. The fear and anxiety generated in Halloween is so strong, so tangible, that the kills themselves actually work as a sort of stress release; when Michael does strike, regardless of how horrific his actions might be, we breathe a guilty sigh of relief because, at the very least, we finally know where he is. Carpenter himself once said real terror lies not in the event, but the anticipation of that event, and it’s this philosophy that carries Halloween to a level few of its imitators ever attained. Michael’s uncanny ability to appear anywhere, at any given time, keeps us on edge from start to finish, and it isn’t long after the movie begins that we understand exactly why Dr. Loomis is so very, very concerned. I think you're right on Dave. Too many modern horror films take all the suspense out and instead insert massive amounts of gore. The art of building tension is a lost one, and one that Carpenter did marvelously with this film.